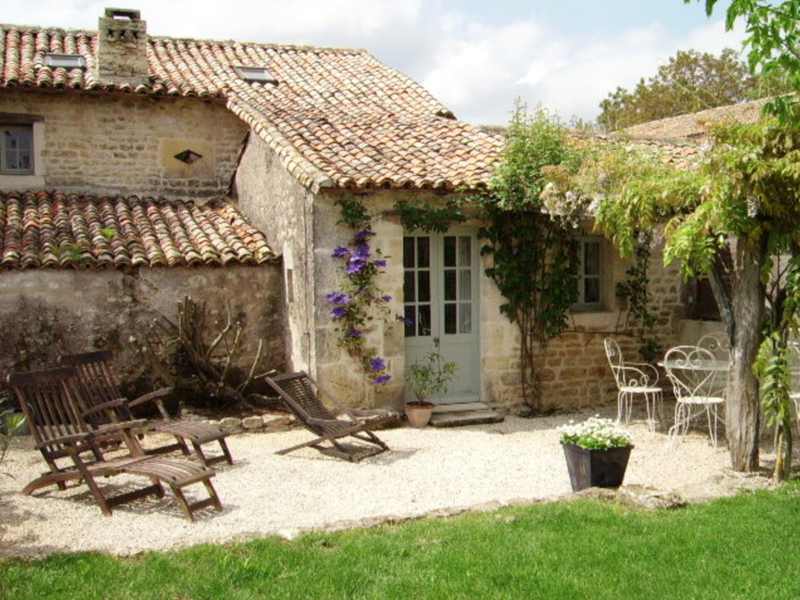 A traditional stone built, detached property dating back over two hundred years, set in three acres of undulating meadowland and comprising a restored 'maison de campagne' and a converted 'étable' (stable). 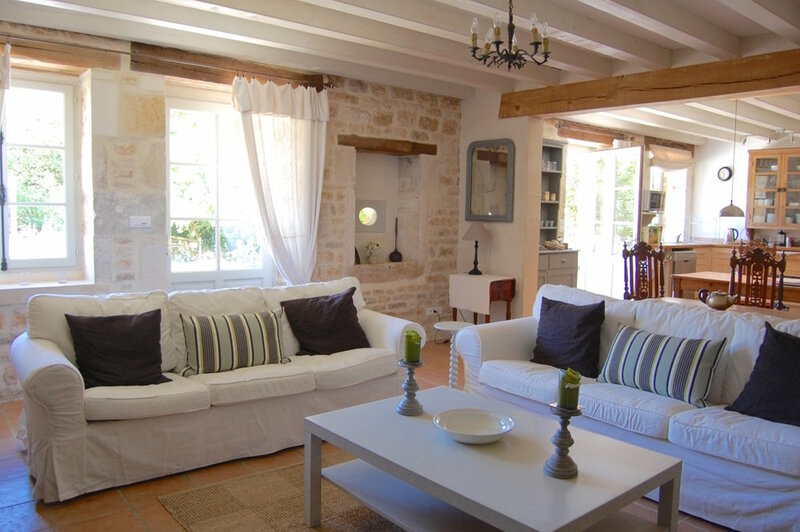 Furnishings and decoration have been carefully chosen to exploit and reflect the preserved architectural charm. Evidence of the restoration work runs right through from the rebuilt stone walls and repositioned oak beams to the restored and hand painted furniture. The thick stone walls and cool terracotta floor tiles maintain a natural coolness in the summer and the 'artisan' made traditional wooden windows and doors, are all double glazed. Natural fabrics and linens frame the windows and doors with refreshing simplicity. Sitting/dining room - is a large, light and airy open plan room with exposed honey coloured stone walls and painted beams. At the sitting room end there's a traditional Charentaise fireplace, two comfy settees and armchairs, a low table and a painted cupboard housing a UK Satellite TV, DVD player, and MP3 micro system with USB port. The dining area has an old refectory table, carved wooden chairs and a painted dresser. Kitchen - has solid wood worktops, an old glazed wall cupboard and is fully equipped with a stainless steel sink, dishwasher, fridge/freezer, stainless steel electric oven, gas hob, extractor hood and microwave. Equipped for cooks and 'foodies' with 'Bodum' type cafetière, electric hand mixer, kettle, toaster, stainless steel pans, plain white crockery, oyster knives. Living room - a separate 'petit salon' with French doors onto the garden with lovely views over the meadow, exposed stone walls, beams, double bed settee, superb old desk, book case and armchair - an ideal writer's retreat! Utility room - housing the central heating boiler, washing machine, tumble drier, sink, recycling bins, clothes airer and a built in broom cupboard housing ironing board, iron, vacuum cleaner etc. 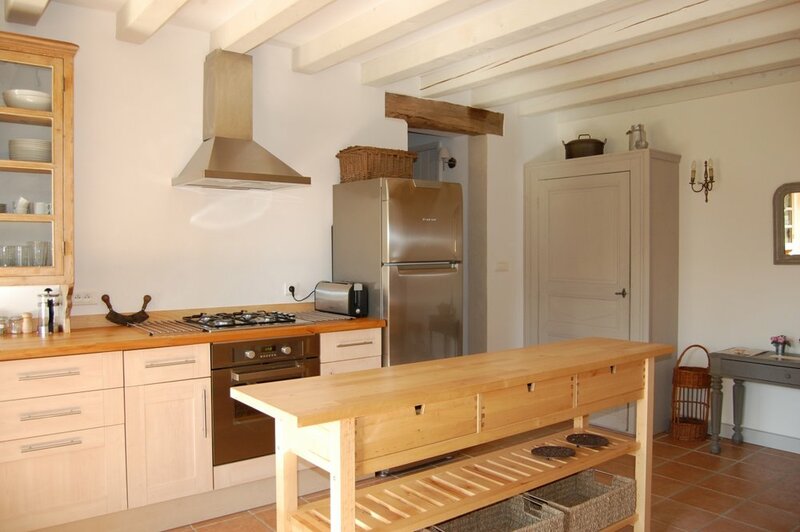 There are two bathrooms and three large bedrooms with oak beams, exposed stone walls and white washed floorboards. Principal bedroom - with its view onto the herb garden, has a king size bed, a built in wardrobe/shelves using old reclaimed shutters and an antique dressing table. The en suite shower room with toilet, washbasin and large shower has a sweet little window and is predominately white in colour. Triple bedroom - has three lovely antique pine box beds, a wardrobe, an old pine chest of drawers, wooden chapel chairs and a view onto the garden. Double bedroom - has a magnificent wardrobe, old double bed, chest of drawers and a lovely view onto pasture and woodland. Bathroom - which is bright white with a roof window, a bath with shower, a toilet and a washbasin. The house faces south and its front borders are planted with old fashioned, scented climbing roses and lavenders. The garden is walled to one side with iron entrance gates and a gravel driveway to the parking area. There is a small sunken herb garden inspired by the Carolingian gardens of the region and a wonderful view from the lawn over the meadow, which is occasionally grazed by a handsome horse, an adorable donkey or a few sheep. The shady open barn, planted with wisteria and clematis, under which is a gas barbecue and table tennis table. A wooden pergola planted with young vines offers dappled shady protection from the often scorching sunshine. The large wooden table and chairs make it a perfect setting for outdoor eating and drinking with views across the rolling landscape as the sun eventually sets in the West giving way to unpolluted star spangled skies. The heated saltwater swimming pool (6m x 3m) has been carefully designed to provide a private sun bathing area of honey coloured stone and along with the sound of trickling water from the wall fountain, it integrates harmoniously into the natural environment.